Living organisms such as plants and animals survive on food. The food gives them the energy to perform several activities in their life and helps in the growth. Nutrients - Certain substances are present in the foods that help in the survival of the organisms. These special substances are called nutrients for example, proteins, vitamins, carbohydrates, minerals and fats. Some living organisms like plants synthesize their food by themselves by themselves while others such as animals depend upon the plants and other animals for their food. How do plants prepare their food? The process by which plants prepare their food by using these raw materials is called Photosynthesis. Where is the food made in plants? Leaves are also known as the Food Factories of the plants as they are the places where food is prepared. 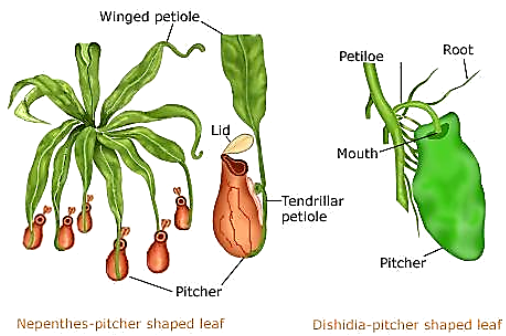 Different parts of the plants like roots gather the raw materials from the environment and then transfer them to the leaves where photosynthesis takes place. 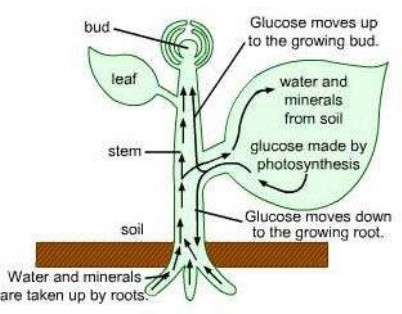 Transportation of water and Minerals in plants - The roots of the plants absorbs the water and minerals of the soil and then transports them to the leaves via stems and branches. Inhalation of Carbon Dioxide - There are tiny holes or pores present on the surface of the leaves called Stomata that take in the carbon dioxide present in the atmosphere. Presences of Chlorophyll in the Leaves - A substance called Chlorophyll is present in the leaves of the plants. It is a green colour pigment. The chlorophyll not only provides green colour to the leaves but also helps in the process of photosynthesis. Chlorophyll captures the sunlight and along with other raw materials prepares the food in the leaves. This process of photosynthesis only occurs in the daytime in the presence of Sunlight hence it is called Photosynthesis, photo means light. Why sun is called the ultimate source of energy for all living organisms? We know that the plants use solar energy to make their food. The herbivores animals depend upon the plants for their food. Animals (carnivores) that do not eat plants depend upon the herbivores animals. Therefore, all of the living organisms directly or indirectly receive their energy from the Sun. The Nucleus - Every cell has a nucleus present in the centre that performs various functions of the cell. The Cell Membrane - Every cell has an outer boundary which protects the cell called the Cell Membrane. The cytoplasm - Every cell has a gel-like structure present in it called the Cytoplasm. Can photosynthesis take place in other parts of the plant? Yes, green stems and branches of the plants can also undergo the process of photosynthesis. For example, plants in the desert area like cactus do not have leaves but they still exist there because their stem produces the food for the plant. Why is the process of photosynthesis important? There will be no food if the plants would stop conducting the photosynthesis process. The plants take in carbon dioxide and produce oxygen during the process of photosynthesis. Hence, without this process, it would not be possible to survive on earth as they would be no oxygen. Plants use carbon dioxide and water in presence of the sunlight and chlorophyll to produce carbohydrates and oxygen. The carbohydrates thus produced by the plants are converted into starch. 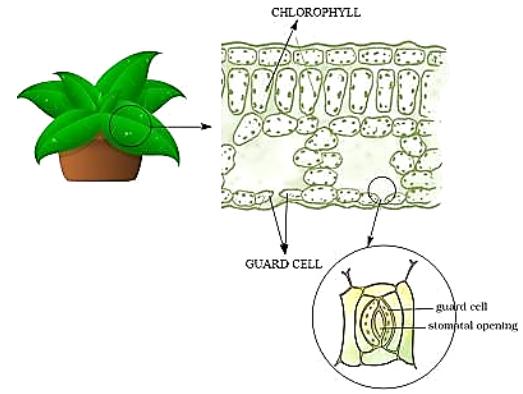 Chloroplasts are special cell organelles that are found only in plant cells. They are called the food producers of the plant cells. 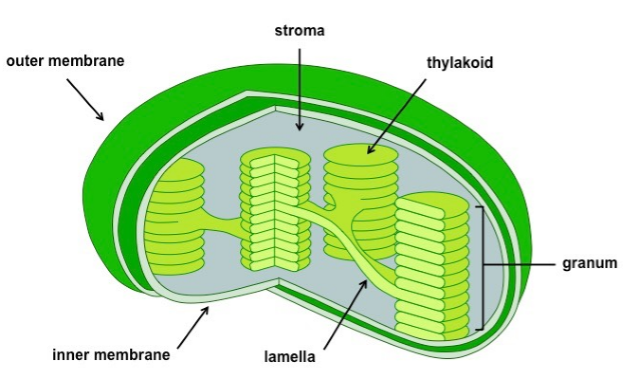 The chloroplasts are surrounded by two membranes called the Inner and Outer Membrane. The inner membrane surrounds stroma and thylakoid stacks. The chlorophyll molecules are present on each of the thylakoids. The chloroplasts convert the sunlight into sugars that are used by the plant cells. 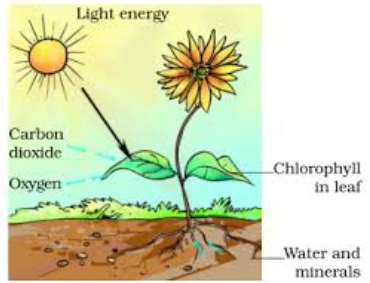 Hence, chloroplasts allow the conduction of the process of photosynthesis. The chlorophyll that can absorb the sunlight is present inside the chloroplasts. When the light of the sun hits the chloroplasts and the chlorophyll, the light energy is converted into chemical energy found in compounds such as ATP and NADPH. Then these energy molecules move into the stroma where carbon dioxide is attached to them. As a result of the molecular reactions, oxygen and glucose are created. Can leaves which are red or Brown or violet in colour conduct photosynthesis? Yes, the chlorophyll is also present in leaves that are not green in color. They are of different colours because the other colour pigments are more than the green colour pigments in such leaves. How do plants generate proteins and fats? Along with carbohydrates, plants can also produce proteins and fats which are formed with the help of Nitrogen. Nitrogen is present in large amounts in the air but plants cannot consume the nitrogen directly from the atmosphere. The soil often contains some bacteria that are capable of converting the nitrogen into nitrates which can be the used by the plants. Also, fertilizers used by farmers and gardeners contain a high amount of Nitrogen which mixes into the soil and is used by the plants. Many plants do not contain any chlorophyll. Hence they are unable to prepare their food by themselves. Therefore, they rely on other plants and animals for their food. 1. Parasitic Plants - Some plants live on another plant for their nutrition. These are called parasites. The plants on which these parasitic plants survive are called the host. 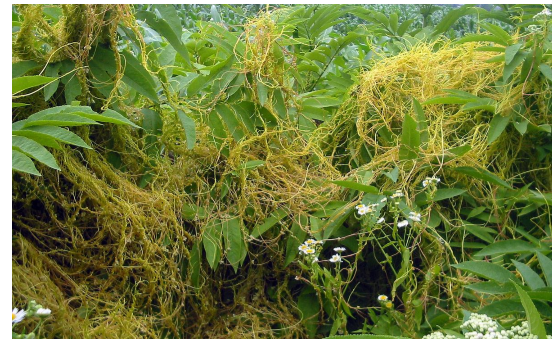 For Example, cuscuta is a parasitic plant. 3. 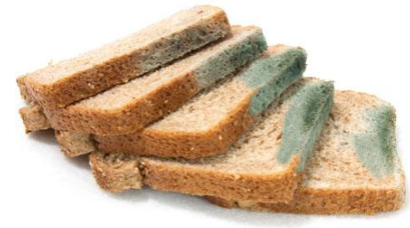 Saprotrophs - Some organisms survive on decaying food and organisms. This mode of nutrition is called saprotrophic nutrition and the organisms that survive because of the saprotrophic nutrition are called Saprophytes. How do saprophytes obtain their nutrition? The saprophytes secrete digestive juices on the decaying and dead matter. These juices convert the matter into a solution. The saprophytes that absorb the nutrients from the solution. For Example, Fungi (yeast and mushrooms) are a saprophytes that can be found on stale food and pickles which are exposed to the hot and humid environment. 4. Symbiotic Relationship - Sometimes organisms live together to share shelter and food with each other. These are said to have a symbiotic relationship. Some fungi live in the roots of the trees. These fungi take food from the trees and in return help the trees in absorbing water and nutrients from the soil. Sometimes an organism that contains chlorophyll such as algae lives in association with a fungus (together called as Lichens). The algae provide food and nutrition to the fungus while the fungus provides water, minerals and shelter to the algae. Plants get their nutrients from the soil mainly hence there is a need to replenish the soil again with nutrients so that the plants can survive on it. Fertilizers and manure are often used to replenish the soil with the nutrients. They contain potassium, phosphorus and nitrogen all of which are important for the plants. 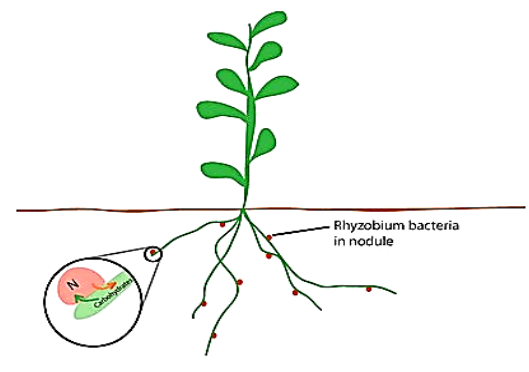 A bacterium called Rhizobium is present in the soil which can convert nitrogen present in it in the form that can be consumed by the plants.